Last week, in an overview of how to determine the age of a skeletal victim, I mentioned a process called epiphyseal fusion. We’re going to delve into that topic in more depth today. 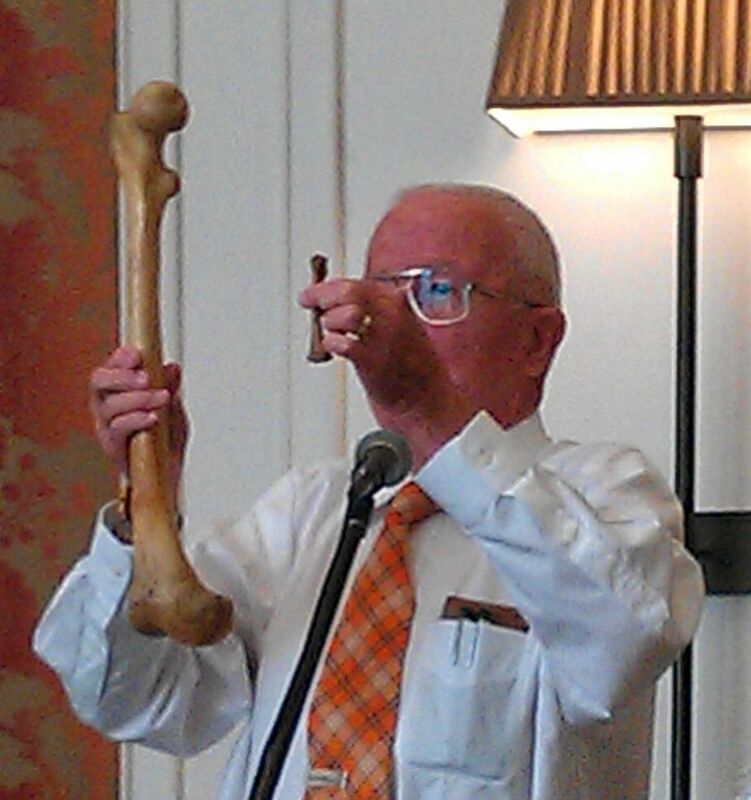 In the picture above, forensic anthropologist Dr. Bill Bass holds two bones ― an infant and an adult human femur. How do tiny infant bones mature to an adult size that could be as much as five or six times bigger? The answer lies in long bone growth. Long bones have three distinct sections ― the diaphysis, or shaft; the metaphysis, or the flared end of the shaft; and the epiphysis, or end cap of the bone. 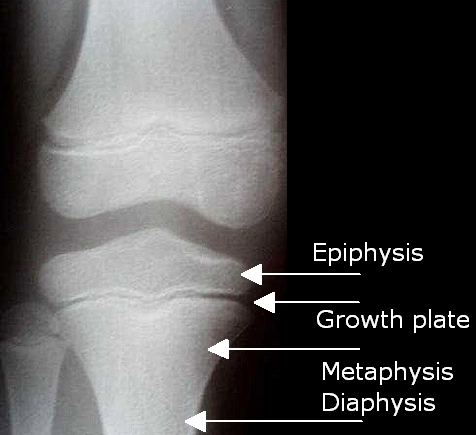 Long bone growth takes place at the epiphyseal or growth plate, located between the metaphysis and epiphysis. 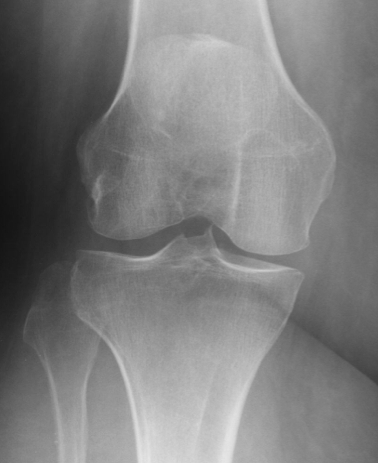 In the picture below, all three sections of bone are clearly visible in a knee x-ray of a young person. All three bones, the femur above, and the tibia and fibula below, show the gap where the growth plate still exists. The growth plate itself is made up of a scaffold of cartilage. Osteoblasts, the fibroblast-like cells responsible for bone creation, are laid down on this scaffold. The osteoblasts produce a collagen matrix that is then mineralized to become new bone. If growth is still ongoing, more cartilage is laid down on that bone as the growth plate moves farther away from the center of the shaft, and the process repeats. When maturity is finally reached, growth stops and the epiphysis and metaphysis permanently fuse together. The x-ray below shows a normal adult knee. As you can see, no trace of the growth plate remains and epiphyseal fusion is complete. The key to epiphyseal fusion in a forensic setting is the information it can give about a victim’s age at the time of death. Each bone has a predictable age range when long bone fusion occurs; in fact, different ends of the bone each have their own individual range. The table below gives examples of five different long bones and the expected age where epiphyseal fusion occurs. Until that point, the end of the bone is a distinct and separate piece from the shaft. As you can see from these examples, age determination is not an exact science. Ranges of fusion can span five, or even ten, years. If a full set of remains is available, a forensic anthropologist will use multiple bone markers to make his best age estimation; if only partial remains are available, then the best estimate possible will be made based on whichever bones are present. If the victim is an adult and even the medial clavicle ― the very last fusion point ― is fused, then an alternate method of aging must be used. We’ll look at one of those different techniques in our next Forensics 101 post. Ann and I are going to be taking a few weeks off from blogging to enjoy the chaos of the season and to hopefully take advantage of the time to concentrate on our writing. But we’ll be back on January 3, 2012 with our first new blog post of the year. From both of us to all of you, happy holidays!